Istaphase MG contains Voglibose, Metformin and Glimepiride. Voglibose belongs to the class of drugs known as Alpha Glucosidase Inhibitors (AGIs). Metformin belongs to the class of Biguanides and Glimepride belongs to the class of Sulphonyl Ureas. Available in two strengths Istaphase MG 1 and 2 (Voglibose 0.2 mg, Metformin SR 500 mg and Glimepride 1/2 mg ), Indicated in diabetic patients with uncontrolled on dual drug therapy of Oral Hypoglycemic Agents (OHAs). 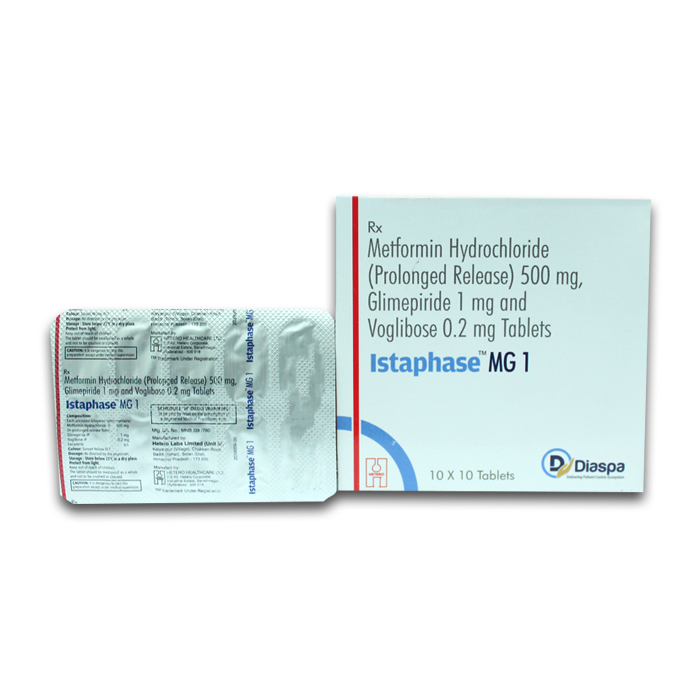 Istaphase MG 1mg/500mg/0.2mg Tablet is used in the treatment of type 2 diabetes.